Eating Lettuce Before Exercise Prevent Damage of Cell – Exercise has many benefits, but there are also risks damage to the body’s cells when too tiring. Fortunately, this risk can be prevented by a very simple way, namely by eating lettuce before exercising. The risk of cell damage can occur due to too much physical activity can increase free radical formation. But can lead to cancer, free radicals are composed of harmful oxygen molecules also accelerate the aging process. But do not worry, this risk is believed to be very small and may only occur in extreme sports are very heavy and tiring. Moreover, research at Edinburgh Napier University show that there is an easy way to prevent such damage. Salads, especially lettuce or watercress is known to have antioxidant properties that can counteract the effects of free radicals. If taken before heavy exercise, the risk of cell damage from free radicals can be resisted by antioxidants. Benefit was demonstrated when the researcher, Mark Fogarty conducted experiments on 10 adult participants. The participants were asked to eat watercress every day for 8 weeks, and then asked to exercise on a treadmill that has adjustable levels of difficulty. 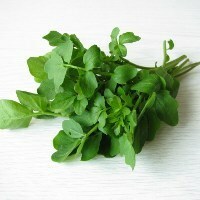 Than when not eating watercress, participants in this experiment showed fewer changes in the structure Deoxyribo Nucleic Acid (DNA). Minor changes that suggest that exercise-induced cell damage was also lower.